The Khamsin was part of Campagnolo's Fluid-Dynamic wheel line. These disc wheels first appeared in 1986 and through 1987, they were offered in 600/650 & 700c. However, by 1988, the 24" front disc had been dropped. Interestingly, the 700c rear disc was offered as a standard road wheel as well as a road & track version. The later used a special hub that could be converted by changing the axle. One side of the hub was threaded for freewheels while the other side had a thread on which the track cog with its inverse thread lockout could be fitted. A cover for the thread not in use was provided. 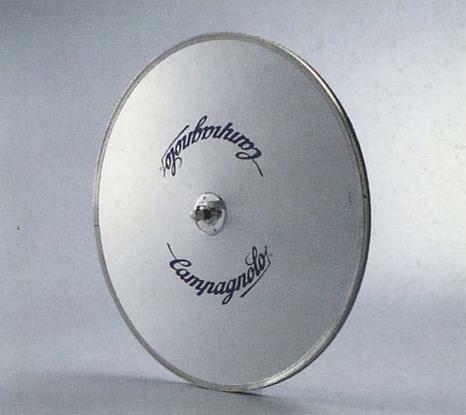 Below I have listed the weight and spacing for the 650c & 700c wheels according to the 1988 Campagnolo catalog.